Apartment right in Oslo city center. One bedroom, a living/dining room area and fully equipped kitchen. Free Wi-Fi. 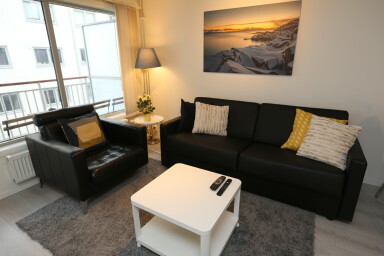 This apartment by Sonderland Apartments is located right by Teaterplassen with cafes and restaurants. Its only a short walk from the Oslo Opera House, the main train station, the Bus Terminal and Karl Johans gate, Oslo's main pedestrian street with restaurants, shopping and The Royal Palace. The apartment has one bedroom with 2 single beds, one single bed and a double sofa bed in the living room, and a fully equipped kitchen where you can make your own meals. The bathroom has a washing machine, a dryer, iron and hair dryer. There is an elevator in the building and a little sitting area on the balcony. It is located in a gated building complex with gardens and outdoor play areas for kids.